San Juan beach, also dubbed as the “Surfing Capital of the Philippines” is one of the destinations where Monol keeps coming back to because it is an ideal package deal for a quick getaway. It takes only two hours to go there, so a day would be enough for a round trip back to Baguio. Make the most of the day by riding through the waves and surfing lessons which costs around 400 pesos per head or by just simply sitting along the shore, talking, and pigging out. Patar Beach is located in Bolinao, Pangasinan a four hour-travel from Baguio City. This haven boasts crystal clear water and mocha-colored sand, as well as the serene atmosphere of unadulterated nature. Patar beach’s country side vibe, traditional huts, and warm-hearted people, overall, is a haven for your laid-back precedence. Aside from the swimming activity, you can also explore some nearby attractions such as the Enchanted Cave, Bolinao Falls, and Lighthouse. The municipality of Pagudpud is located in Ilocos Norte, an eight-hour ride from Baguio City. It may sound quite a long journey on the way there, but it’s all worth it upon being greeted by white sand beach and crystal clear shores thus gaining its title as “Boracay of the North”. Aside from this, you can also enjoy the Bangui Wind farm, light house, museums, parks, and waterfalls. Hundred Islands National Park is considered as one of the National Geological Monuments of the Philippines consisting of whooping 123 islands or 124 islands during low-tide where you can do lots of activities such as paragliding, banana boating, snorkeling, and canoe plus picnic and lots of photo-opts. It takes three hours and thirty minutes from Baguio. Lingayen beach is one of the nearest beaches from Baguio City. It would only take you two hours and a half to reach this serene and breezy place. Lingayen gulf is known as a military base during the World War II. Not far from the beach is the provincial capitol where you could drop by to have a background of its history. In between the beach and the capitol is a display of the actual military equipment used during the era. If you wish to spend your time at the shore, there are free cottages where you can chill, a pavement where you can stroll, and some food stalls or nearby hotel restaurants to grab a bite. Either way is a delightful experience to just sit around and unwind. If you wish to explore some of these destinations, Monol conducts weekend trip every two weeks where you can enjoy doing outdoor activities with other students. Writing assignments, tests, presentations, classes, home works – we know you’re busy. With all these jam packed tasks and the limited time in the academy, it’s almost improbable to take a break and replace these with activity filled breather outside Baguio, add to that the hassle of long hours of traveling and the curfew. But what if we tell you that there is a haven, not so far away, where you can do bunch of activities all in one day? Located at the Municipality of Pugo, La Union, Pugo Adventure or also known as PUGAD, is the combo meal version of rest, relaxation and adventures. 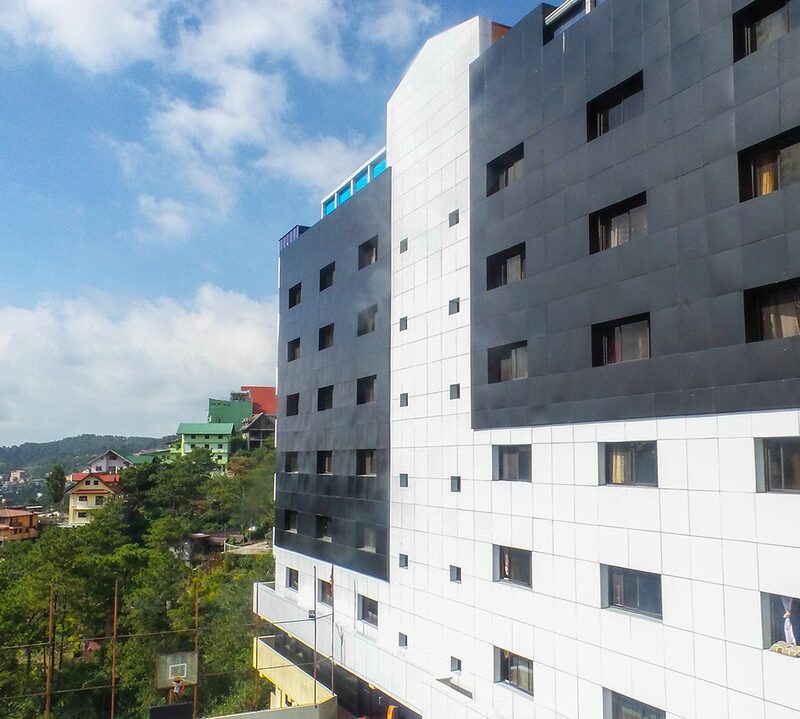 Within an hour of travel from Baguio City, this adventure hub would be a great escapade from the city life especially when you tag your friends along. For the adrenaline junkie, feel free to choose your cup of tea from several activities such as ziplining, ATV, wall climbing, rappelling, and water adventures such as kayaking, jet skiing, and others. If you are the slightly active type of person who finds pleasure through reading books, dipping into the water, or simply observing nature, you can stay at one of the huts or kubo overlooking the swimming pool. Either way, the lush greenery would never fail to give you the break you deserve. Pita bread. Hummus. Kebab. Falafel. Just the sounds of these make us picture the sandy dunes of the Middle East. The convenient thing is you don’t have to jump right off the next flight just to have a taste of Middle Eastern cuisine. Here in Baguio, you can find food hubs that give you the same taste in form of a good deal. Samosa. BlauEarth. 30 May 2015. Web. 19 July 2017. <blauearth.com>. More often than not, when Middle Eastern food is being mentioned, the first thing that comes to mind is Ahmad Brothers Café. Ahmad Brothers Café serves authentic Middle Eastern food, plus, the staff is nice and accommodating. Aside from that, they serve halal food which means “permissible according to Islamic law”. Sold meat has undergone a process that is acceptable in accordance with the law. The processes involve pronouncing Allah’s name, slaughtering through the jugular vein (the veins found in the neck), and speaking a dedication while doing the process. This restaurant has moved from Legarda Road to Jose Miguel Bldg., #01 Yandok St., Corner Naguillan Rd., Baguio City, open from 10 am to 10 pm. This restaurant claims to have the “Best shawarma and kebabs in town.” and that is not just an empty claim. Owned by two Lebanese cousins who grew up in Baguio City, their passion for food and their desire to trace their roots are the reasons why their shawarma is loved by their regulars. This restaurant has two branches, one at Ground floor Cuesta Bldg., Bonifacio St. which is open from 8:00 am to 10:00 am and the other at Travel Lite Hotel which is open 24-hours a day. Shawarma. looloo. 24 June 2015. Web. 18 July 2017. <looloo.com>. If you’re looking for a budget friendly restaurant that gives the same fulfilling taste without breaking the bank, Ali’s is the best for you. This humble place is situated at 177 Upper Bonifacio Street, Baguio, nearby Saint Louis University Gate 4. Ali’s House of Shawarma also serves Halal food. For only 35.00 pesos, you can enjoy a palatable warm shawarma. If you opt for rice meal, your 60.00 pesos will give you justice. **Featured image: A beautiful display of some of the most popular Middle Eastern flavours that are good enough to eat alone. Egyptian Streets. 2014 June 5. Web. 17 July 2017. <egyptianstreets.com>. is a cliché for a reason. While most of us go to other country to experience new things, immerse in a different culture, or change our lives, we can’t help but miss a thing or two about our mother country, that given, is the food. Thereupon at times when we miss the food, we somehow miss home. But because Baguio is a pool of diverse cultures, this city also caters to international dishes. For students who miss their local food, there are some restaurants situated in this city that could somehow fill that longing heart. To start with, here are two hubs you can run to when you crave for noodles made of sticky rice, lots of herbs, fish sauce, and dishes that tells the story of French influence and neighboring countries the second your tongue touches the food – that is Vietnamese cuisine. From their branch in Camp John Hay, this Vietnamese restaurant has moved to a more accessible location in Upper Session Road, Engineers Hill, Baguio City. Rumor has it that their customer service is excellent, their dishes are authentic, and apparently, are quite affordable. Yes Pho Menu. X Marks the Spot for Good Baguio Foods. 10 March 2017. Web. 10 July 2017. <findgoodbaguiofoods.com>. Pho Bo by Yes Pho. The Kitchen Goddess Files. Web. 10 July 2017. <thekitchengoddess.blogspot.com>. Their best seller? Pho Bo—- a steamy pot of noodle soup with simmered beef and vegetables seasoned with flavorful spices. Truly a Viet classic! The Coffee Library is a rustic themed restaurant that makes you feel out of the city in the city. Aside from Pho Bo, Vietnamese coffee, which often is complemented by coconut milk is one of the goods this restaurant is proud of. The Coffee Library interior. Pinkislovebynix. 24 December 2016. Web. 10 July 2017. <pinkislovebynix.blogspot.com>. Hot Chocolate. turista trails. 25 July 2016. Web. 10 July 2017. <turistatrails.com>. Since their opening in 2015, this café and restaurant has been gaining commendable reputation for its delish grubs. That is why earlier this year, The Coffee Library has opened another branch in San Juan, La Union. Pop by The Coffee Library located at Rex Hall Building, Upper Bonifacio Road, Baguio City. Open from 8:00 am to 11:00 pm. **featured image: Vietnamese Cuisine. Ngoc Long. 3 December 2015. Web. 10 July 2017. <ngoclongfood.com>.